A New Hampshire restaurant will soon unveil a menu of content made from CBD, an oil extracted from the cannabis plant that does not contain THC. CBD, an oil extracted from the cannabis plant, does not contain THC, the active ingredient that gets marijuana users high. Proponents of the oil say it has an array of health benefits. Fresh Vibes Cafe will offer foods and drinks containing CBD. Inside Fresh Vibes Café in Rochester, New Hampshire, something new is brewing. 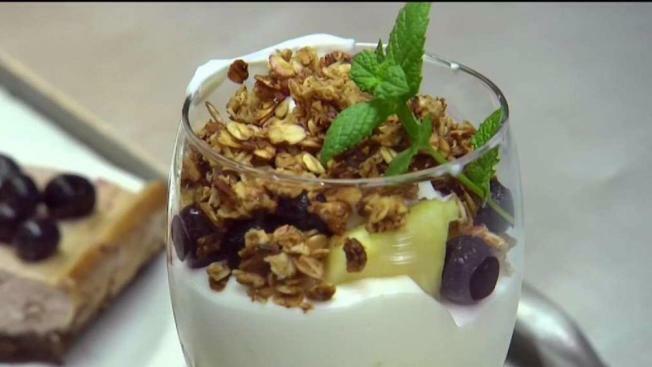 "It's a cup of coffee that gets you off painkillers, opioids, all addictions that are out there," said chef Leighton Knowles. The coffee is infused with CBD, a cannabis extract that proponents say has an array of health benefits. "If you are anxious, it will calm you down. If you have pain, it will suppress those pains," Knowles told NBC10 Boston. You might consider Knowles a pioneer in the CBD community. After hosting an infused dinner at the James Beard House in New York City, he started Flower Power Coffee Company last year. "As a way to educate and advocate, but also give people something they can benefit from," Knowles explained. Because CBD doesn't contain THC, which is the active ingredient in marijuana, it doesn't have the same effect. "Because we are hemp, you can't get high," he said. "There's no THC." That's also what makes it perfectly legal for the owner of Fresh Vibes, Kris Enis, to sell it to customers who want to try it. "When I do drink the coffee, I notice I calm down," Enis said. She's had Flower Power Coffee at the café for a long time, but now she's working with Knowles on a CBD infused menu. "I just thought it would be really cool to introduce it into food," Enis said. She's pairing her love of food with CBD's potential benefits, hoping to mix up a recipe for success. Enis won't launch the menu until her staff is trained to answer any questions customers have about CBD. She plans to offer her infused dishes by the middle of August.